Embleton Way is the spur road through the estate on Mount Pleasant that lies within Buckingham’s by-pass. Embleton is a northern name and it was brought to Buckingham when George Kenneth Embleton, RN was appointed headmaster of its Royal Latin School in 1948. “George” Embleton served the school with distinction and fierce purpose for thirty years. Without George Embleton’s steely resolve, Buckingham’s grammar school, recently termed an “outstanding provider” by Ofsted, would surely have become a comprehensive establishment. But, Embleton Way pays only oblique tribute to “GKE” as it is named after his wife, Edna Embleton, MBE, who was a local politician, activist, hostess, charity organiser and a school secretary. Edna Dorothy Robinson, a Londoner, was evacuated with her sister, Jean, to North Bucks during World War II. Edna soon made her mark in tennis, hockey and athletics and before long she had conquered all and had become the Royal Latin School’s Victrix Ludorum. After she left school, Edna taught at Buckingham County Primary School in Well Street for six years. Just over the river Great Ouse another school beckoned. Soon, Edna became George Embleton’s right hand woman, taking over as his School Secretary and marrying him one bright “St George’s Day”. The newly weds lived next to the Latin School’s library in Grenville Cottage. The school thrived and outgrew its premises. A new school was built along Brookfield Lane and the Embletons moved to the grander “Brookfield House”, a 19th century hunting lodge built for kindly Arthur Byass whose family had made bodegaloads of money from sherry. 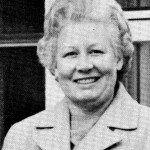 Edna became a local councillor and then Mayor of Buckingham after her outstanding ability to focus on decision-making and action was recognised. It was not long before Edna had moved on to Aylesbury Vale District Council where she again acted as its leader becoming Chairman. Edna was equally as involved in charities such as the Royal Lifeboat Association, clubs such as the Buckingham Tennis Club, and societies like Inner Wheel. After George had retired, Edna took over the Latin School as Chairman of its governing body. It would take a chapter not a page to celebrate Edna’s many roles which led indirectly to the award of an M.B.E.. However, few readers will realise that secret meetings hosted by Edna in Brookfield spawned Britain’s first independent university in Buckingham. Embleton Way celebrates a life of duty and service. Maybe, it’s is a path, a way, for others to follow.